Join us for Drinks + Demos! 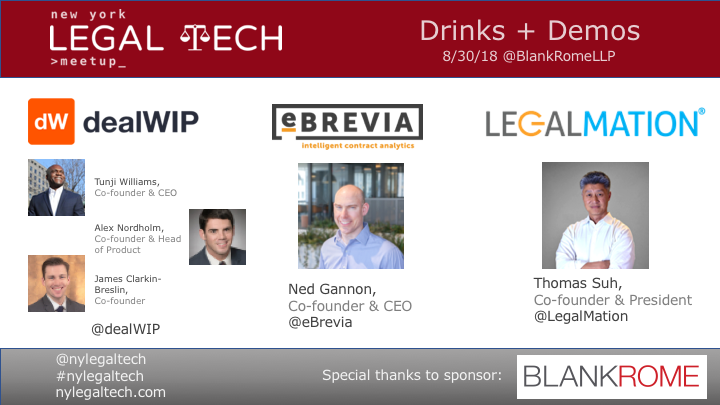 When: Thursday, Aug. 30th, 2018, 6:30 p.m.
What: Drinks (and pizza), networking, and live demos of some of the most interesting and innovative legal tech products in the market today, including audience Q&A. Note for students: We’re always happy to waive the cover charge for current students (and we always need extra pairs of hands to volunteer at the check-in table for 20 mins., etc., which we’d love your help with). To RSVP/volunteer, please reach out to the organizer directly on the meetup platform (or by email with your meetup.com username). 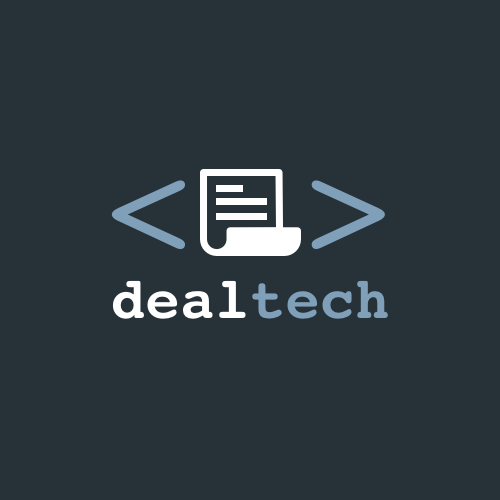 dealWIP is a legal transaction management platform built by corporate lawyers, for corporate lawyers. 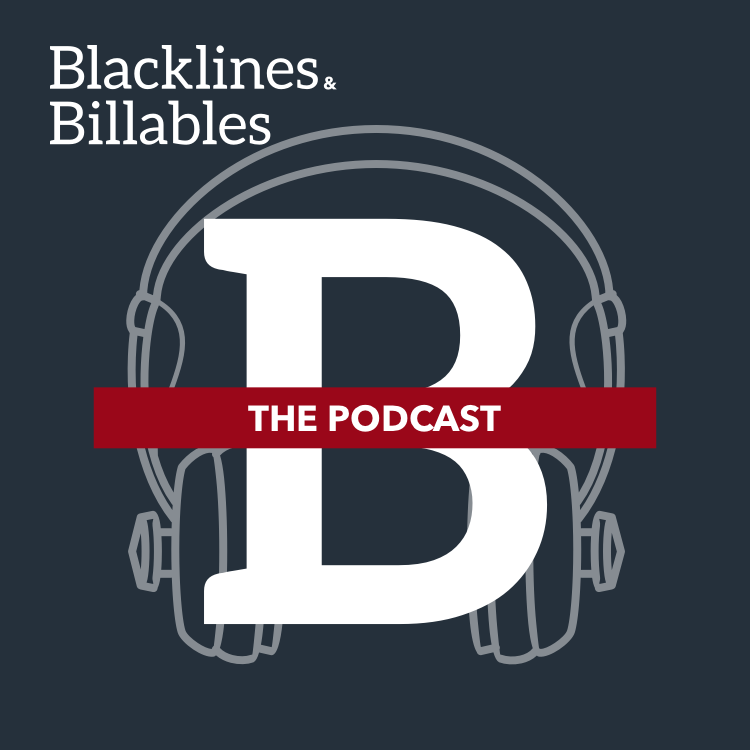 dealWIP is focused on addressing the myriad inefficiencies experienced by deal attorneys, starting with the due diligence Q&A process. By providing a secure, centralized workspace through which parties can trade diligence questions and responses, flag problematic issues and documents, and assign tasks to deal team members, dealWIP’s diligence Q&A tool increases transparency into the diligence process while slashing attorney time spent on administrative tasks and reducing the chances that a key issue or document will slip through the cracks. eBrevia’s Contract Analyzer uses industry-leading machine learning and natural language processing technology developed in partnership with Columbia University to extract data from contracts, bringing unprecedented accuracy and speed to contract review and analysis. The intuitive interface and workflow features make the software easy to adopt and use. Expert trained provisions are included and bring immediate efficiency gains for common contract types. Non-technical users can also train eBrevia to extract custom structured and unstructured data in multiple languages. eBrevia is trusted by the world’s largest corporations, law firms, and audit/consulting firms. An AmLaw 100 Chief Knowledge Officer recently called LegalMation, “the AI tool that everyone has been waiting for.” Our mission is simple: to transform the legal services industry by automating the drafting of repetitive/process-driven litigation work product currently performed by attorneys and paralegals (whether at law firms or in corporate legal departments) at every stage of litigation, and allow these professionals to focus on higher value work. Unlike existing AI-based legal tools that assist lawyers in performing their tasks, LegalMation actually performs those tasks. We literally reduce an entire day’s work to two minutes. If you’re interested in demoing a product at a future NY Legal Tech Meetup Drinks + Demos event, apply here: https://nyclegaltech.com/applytodemo/.